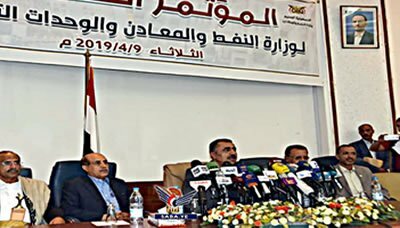 SANAA, April 9 (YPA) -Minister of Oil and Minerals Ahmed Daress on Tuesday said that the cost of losses in the oil and minerals sector due to the aggression estimated at over $ 23.6 billion dollars and 53.9 billion Yemeni riyals until the end of 2018. “There are indirect losses and damage estimated at billions due to the aggression (Saudi-led coalition war) and siege and attacks on oil installations and fuel stations,” the minister told a press conference held by the ministry in capital Sanaa, noting that the losses are increasing day by day as a result of the continual aggression. “More than once, the coalition has held oil derivative ships and obstructed their access to the port of Hodeidah, despite obtaining permits from the United Nations,” he said.